Cellcos and handset manufacturers here are counting on the seemingly limitless Japanese craving to trade up to the trendiest and newest feature-packed cellies to push cash flow forward. 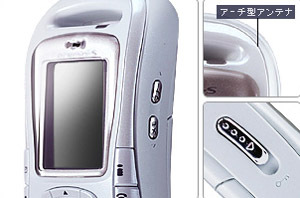 Right behind the recent roll out of DoCoMo’s shiny, feature-packed 3G FOMA 901i-series comes a new line of four “Mova” (the carrier’s 2G brand) handsets targeting niche buyers. Lets take a look at these babies as each one has a distinctive feature targeting a specific, finicky, not-yet-ready-for-3G keitai shopper. Niche marketing is undeniably cost-intensive — all those handsets require development, marketing and manpower to support. If 3G is where DoCoMo wants everyone to be, why continue to innovate within the older, 2G Mova line? One answer is that cell phones are often a family affair; parents pay for the kids’ handsets as well — even if those kids are in college and beyond — and traditionally they stay with just one provider. Mova is a necessary option when budgets cannot or will not stretch to handle a lot of entertainment subscriptions on top of the high cost of a 3G handset itself. Eye-candy variations like the Lechiffon and Music Porter, introduced below, in the Mova line provide an affordably stylish celly with sufficient hardware to jump through a few hoops and which no one is embarrassed to flash around in public. The Prosolid and PreminiS additionally give business users a simple, functional platform for work. One family/one provider means cellcos here are educating the current generation of users and growing the next. Smart and savvy marketing. Given the current Japanese growth figures for 3G, the majority of users will eventually move up to the new, speedy network. In the meantime, providers want to ensure that the cool functionality and infinite variety of their brand’s phones keep Japanese consumers at every age coming back for more. On the shelves this week is the PreminiS, a sportier version of DoCoMo’s original Premini, racked out with easy-grip sides and an optional bright, non-metallic casing; weighing in at a little over 75 grams it’s nearly as small as the original. New to this version is a steeper sloped base for easier finger tapping — though it will still be impossibly small to access for many hands; this tiny series has been trimmed down to just the basics of voice and mobile Net access. 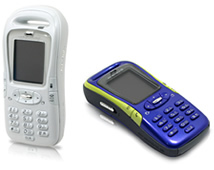 Manufactured by Sony Ericsson, PreminiS has no camera, no fingerprint scanner, no woofers, tweeters or phone fun — aside from some built-in wallpaper variations and colorful “deco-mail” letters/symbols for decorating emails. Its position in the grand scheme of mobile life is as a second phone — a vanity model that can go where no camera phone may tread. Growing numbers of offices, schools, and factories have banned camera-equipped phones in house. This means no mobile access unless your handset is stripped down to old-fashioned basics. DoCoMo is determined to rack up major cool points for this very minor handset via the “PreminiS-town Installation,” happening 4-26 December in Tokyo’s fashionable Daikanyama district where DoCoMo has set up some very un-businesslike gallery space, a night tour, featured shops, and the PreminiS concept café (think the drinks are really, really small?). Go to DoCoMo’s PreminiS website; the info is in Japanese but the intro with “Space Woman” and her PreminiS breast plates is worth the trip alone. Just click on everything, it will be fun. Styled by Panasonic from their P253i and draped all in leather — a first for Japan, at least in phones — Lechiffon sits as the polar opposite to PreminS’ boy-toy status. England has had leather casings on cell phones for some time but in dark colors that tagged them as accessories for geeky guys. Not these pretty pastels! Deliberately feminine, Lechiffon targets young women in their late teens and 20s. The pink version in particular matches very nicely with the hugely PIJ (popular in Japan) Pink Christian Dior logo bag, clothing, and accessory series (no coincidence there). Lechiffon owners can use DoCoMo’s new “partner schedule service” — accessed by keyword email — that links you and a friend’s/partner’s/lover’s schedule so each can check what’s online for the other during the day. A single, 1.9-inch display screen, an average sort of camera, and a new, nail-friendly magnetic release mechanism are part of the package. The camera lens is enclosed in one of three designs: heart, clover, or rectangle. 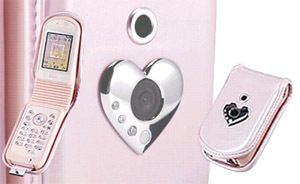 No doubt this is a Cutie, but it could use a Hello Kitty phone strap and maybe some heart-shaped finger pad jewels, don’t you think? Lechiffon will grace shelves sometime in January 2005. Panasonic is producing the Prosolid using their P504i as the concept precursor. Prosolid is, well, plainly styled and aimed squarely at business users who, in Japanese corporate culture, should be plainly styled as well. Like the PreminS, it has been stripped of all camera functions in line with the ban on camera phones in so many venues; Prosolid has the new “partner schedule exchange” feature just like Lechiffon — definitely a plus in a business phone to coordinate meetings, presentations, coffee breaks, and office assignations. Strapped into the sturdy aluminum and magnesium casing is a separate built-in speaker allowing Prosolid to sit up and stand-in for a speakerphone. 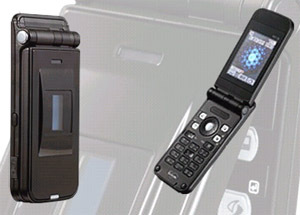 All work and no play makes for a very dull phone so even though DoCoMo sees this as a secondary handset for most users, Prosolid comes with the very unbusiness-like Kirari mail feature. Kirari (Ki for kibun, feeling; rari for hikaru, or to light up) mail assigns different colors to emotions keyed by words contained in incoming mail. Colors playing across the light display let receivers know if mail is happy, angry, or romantic. But the best fun feature is the little button on the side that makes the handset snap open automatically. Click. Cool. Prosolid should be on sale by the time you read this as it was scheduled for a November release. 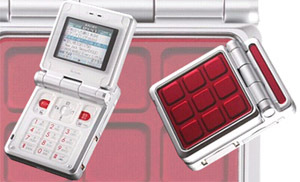 Mitsubishi Electric’s Music Porter is a media player first and a voice communications unit second; DoCoMo are calling it a “music keitai.” Music Porter’s boxy shape makes it look a lot like a scaled down Gameboy Advance SP — but gaming is not really on the main menu here. Music is downloaded and recorded onto a 64-MB memory stick, which can hold about an hour’s worth of tunes, and a built-in FM tuner provides additional musical momentum. The six keys around the center button also handle volume control and track selection; earphones for the handset feature a handy remote control gadget that does the same things. Other features include a USB cable port for direct hook-up to a PC, a 1.8-inch display, and an adequate CCD cam with digital zoom lens. BTW, there is a mirror around the lens casing especially for taking self-portraits. Music Porter comes in three colors (red, white and black) and is scheduled to debut mid-December.